After LACRIMOSA had dedicated almost the whole of last year to live performances - beginning with a sold out concert in Mexico City, following with appearances at a series of festivals in Europe and finally topping it all with their long awaited live album - Tilo Wolff and Anne Nurmi set off for England to record their new single with the LONDON SYMPHONY ORCHESTRA at the legendary ABBEY ROAD STUDIOS. It will be the 6th of April when this 4-track-CD will be released in a large-scale digipack. The main focus lies on two surprisingly contrary versions of the title song, that contains the most sensitive performance of its intensive lyrics, while the power of the second version's musical expression brings out the full potential of this sensitive theme. With "Meine Welt" (My World) the single also includes an exclusive bonus track which goes through a series of changes, transforming from a basic rock song into a bombastic orchestral work in less than 41/2 minutes, while at the same time, in that familiar LACRIMOSA manner, it remains just a mirror image of the lyrics. The final track is the smaching ”Copycat" from the ’95 album ”Inferno”, remixed by SAMAEL. 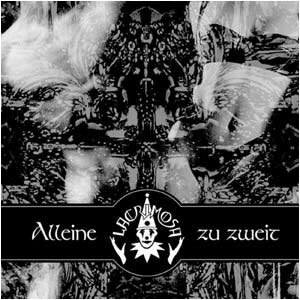 "Alleine zu zweit" (Together Alone), in a razor-sharp and typically uncompromising production, presents the widely differing talents of LACRIMOSA, and once again bursts through the barriers of all conventional styles.